It would appear that Sporting have pushed their side of the Rui Patricio story out to the Portuguese media, and it doesn’t read too fortunate for them. Earlier we covered claims from A Bola that Wolves are playing hardball and are now refusing to go above the €18m figure for the goalkeeper. Due to this, Sporting president Frederico Varabdas is set to fly to England this week to see if he can sort things out in person, with Sporting looking for €25m so they can cover €7/8 debts due to Gestifute as part of the deal. 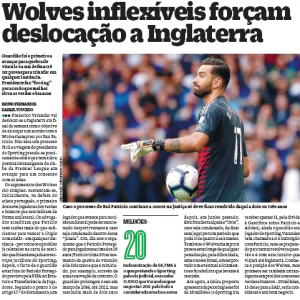 O Jogo back parts of this up and it’s claimed Wolves are being ‘uncompromising’ and ‘inflexible’ over the situation, which isn’t the greatest surprise. Given how Sporting looked to take the club to FIFA and sue for more than €50m, some goodwill has likely been lost along the way. Perhaps more importantly, O Jogo say they’ve been informed that Sporting would face difficulty in proving Wolves tapped Patricio up and encouraged him to terminate his Sporting contract. Even if Sporting won a general case it would be unlikely that Wolves face punishment. Patricio, in the worst case scenario, would also face a shorter ban than the Portuguese club had assumed. Therefore, Sporting can’t be as bullish as they’d hoped. Whereas a few days ago the €25m figure was being pushed, O Jogo say Sporting now know €20m, with €13m to Sporting and €7m to Gestifute, should be considered a good deal.